Another Beautiful Sunday in Paradise. We had slightly cloudy skies, temperatures in the 80s and a tiny SW breeze. 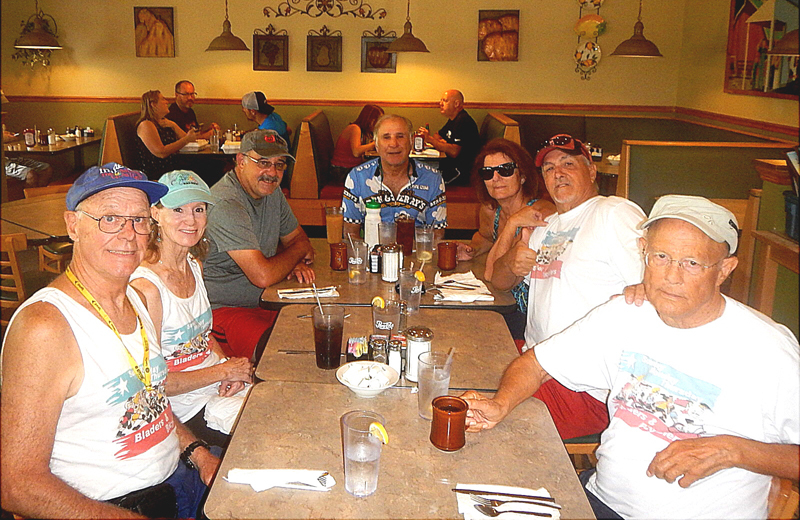 Bladers/Bicyclers (on left) Bruce M & Dorey Anne, Rob H, Roy H, Lech O, Dee T, Steve G, Rick P & Ginnie S and Herb E came. Welcome all. We discussed going North or South on the Trail and even though we had a tiny SW breeze we decided to head North. However first we did Wall Springs Park and then headed North and turned around at the Hwy 19 bridge over the Trail. 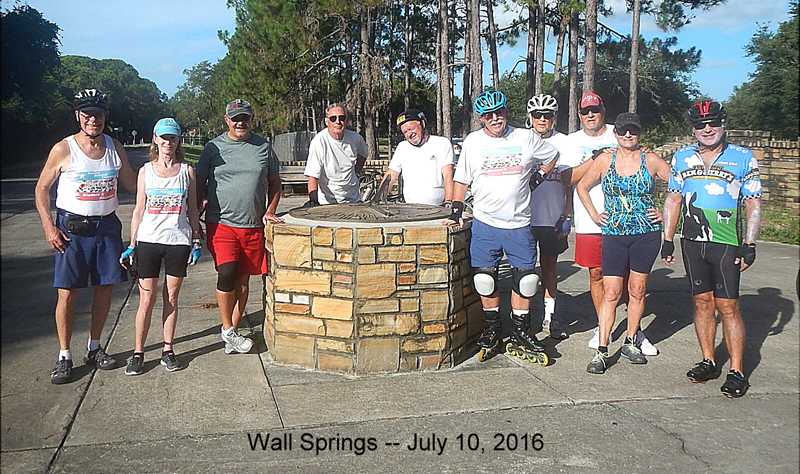 A few of us did the Wall Springs Park Trail again as we returned to the park. We checked out the big wooden tower that we thought had been rebuilt and was finished. However the tower had a locked gate across the entrance and a sign that said it was still under construction. We had 1 Blader and 9 Bicyclers. Some did 9.6 miles, some 10.7 miles and two had biked to Wall Springs Park and did several more miles. We Brunched at Rodies Restaurant as planned. Herb went ahead and reserved us a table. Thanks Herb. We were all then able to walk in and sit down at our table as we arrived. The service was good, the coffee flowed freely and the food great as usual. We had ratings from 9.8 to 10. We gave Rodies a 9.9 rating.